The American Dream of Homeownership is for everyone, bringing security to you and your family. We collaborate with buyers to help them find their ideal property and sellers to get top dollar and transition to their next home. We strive to give you peace of mind when you make one of the biggest shifts in your life. Our knowledge and decades of experience helps you solve the puzzle of the process to take the anxiety out of decision making. We’ll work together to establish the best location and fit to pursue your dreams and ideal lifestyle. We support you through the transition. Our individual background careers in: Communications, Advertising for Callaway Golf, and Counseling at Mt. Tahoma High School have prepared us to effectively market your home, negotiate your purchase or sale and help you identify what kind of housing change is right for you. Trish grew up in Compton, California and moved to Washington during college where she raised her family and created an award winning career in real estate. 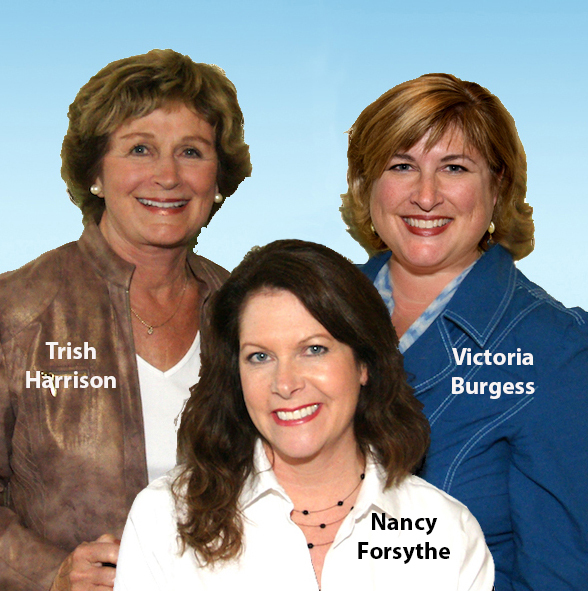 Nancy and Victoria met in Kindergarten at Artondale Elementary in Gig Harbor. They became best friends in middle school due to a love of rainbows. During college, they survived two summers of backpacking through Europe and all that entails. Post college, they were roomies in San Diego eventually becoming “Three’s Company” with Victoria’s future husband, Paul. They worked extra odd jobs, like being Black Jack Dealers, to support their entry-level careers. Life led them back to their hometown of Gig Harbor where they joined Trish in her booming real estate business. Our most fun team adventure is going on weekly broker tour and the things that make us laugh the hardest, we cannot repeat! Ready to discuss your future plans? We are here to guide you!